In this application note, we will show you how to design and build your own DSP-controlled subwoofer with the miniDSP PWR-ICE125 DSP plate amplifier. 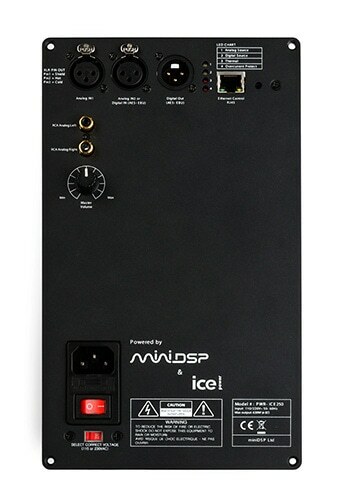 Note that a similar project could be built with the PWR-ICE250 if added power is required. A subwoofer driver (see text below). Ability to run acoustic measurements. You will need a measurement program such as Room EQ Wizard (REW) and measurement hardware such as the UMIK-1. If you are building your DSP-controlled subwoofer from scratch, you will need to select the driver. There are dozens if not hundreds of good quality subwoofer drivers available for DIY use ranging in size from 6" to 21", but drivers in the 10-15" range are typically a good match for the PWR-ICE125. 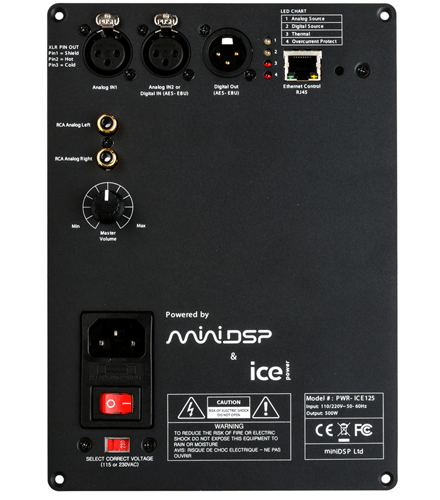 For higher rating, we'd recommend you to select the PWR-ICE250. It can be used with a 4 ohm driver, but if it will be driven hard or in a pro sound application, an 8 ohm driver is recommended. It may also be possible for you to convert an existing subwoofer, either from a passive configuration (external amplifier) or to replace an existing plate amplifier. In this case, you will need to remove the internal amplifier or binding posts and modify the enclosure to fit the miniDSP plate amp. If you are building your own enclosure, you will need to design it for the subwoofer driver you have chosen. The most important factor is the internal volume and, if it's a ported box, the size and length of the port. Fortunately, there are a number of free programs that do the complex math for this based on the Thiele-Small parameters of the woofer. For example, a popular Excel-based program is Unibox. Once designed, you will need to build the enclosure. You can search online for advice on building subwoofer boxes or ask on your favorite online forum. When building the enclosure, we recommend that for most applications, a separate sub-enclosure be built for the plate amplifier, and this sub-enclosure have air-flow vents above and below the amplifier for maximum cooling. For subwoofer use, the PWR-ICE125/250 is run in BTL (bridge-tied load) mode. This means that both channels of the amplifier are used to power the one subwoofer driver, so the two red wires from the amplifier must be connected to the subwoofer terminals. The two black leads can be cut, insulated with electrical tape, or a pointed tool used to remove the center two pins from the 4-way connector that plugs into the amp. For use in a conventional two-channel system, the subwoofer amplifier will take its audio signal from both left and right stereo channels. For analog input, use Y-splitters and connect both left and right channels to the subwoofer inputs. If connecting to an A/V receiver or preamp with a Sub Out connection, only a single cable is needed. For digital input, a normal S/PDIF (RCA/coax) digital source can be connected with an RCA to XLR adapter cable. Alternatively, a transformer adapter such the Canare BCJ-XP-TRB with a BNC-RCA adapter can be used. If you have an AES/EBU digital source (pro balanced connection), then an XLR-XLR cable is used. Note that, even if your audio connection is digital, you may need to use analog connections to hook the amplifier input to your measuring system. If you do, make sure to disconnect any digital sources while doing your measurements. Finally, the Ethernet connection is only needed for configuring the amplifier and is not needed for normal operation. Once everything has been configured to your satisfaction, the Ethernet cable can be disconnected. Double-click on the PWR_ICE2_1x2 application to run it. After a short time, you should see the amplifier appear in the "Device Tree" under "Ethernet Device." To rename it, click on the amp in the Device tree and wait for it to load. Then click on the entry box next to Now connected to:, type in the desired name for that amp, and press Return. You will get a message saying that you need to reboot the amplifier - turn the amplifier off and back on again, and it will reappear in the Device Tree with the new name. If the subwoofer is being driven from a dedicated subwoofer signal, such as the Sub output from an A/V receiver or A/V preamp, select the analog input that you connected to above. If the subwoofer is being integrated into a two-channel system and you connected both left and right input channels, select "Mixed L&R." Also select analog or digital input, depending on whether you have connected an analog or digital source. Finally, you must make sure to set the Amplifier mode to "BTL." This will reconfigure the DSP to drive the power amplifier as a single channel. You can use the Xover block to add a low pass filter, to remove all but subwoofer frequencies. This will be necessary if integrating into a two-channel system, and may or may not be helpful if integrating into a home theater system. You can also add a high pass filter at any frequency down to 10 Hz to remove extreme low frequencies, which can help to protect the driver from over-excursion if you have built a ported subwoofer. Experiment with positioning. The location of a subwoofer in the room can have a dramatic effect on the measured response. Build another one! Using more than one subwoofer can help to even out room modes, as well as increase levels and headroom. Use a Linkwitz transform to extend its low end response (applies to sealed subwoofers only). For more information, see the app note Linkwitz Transform.